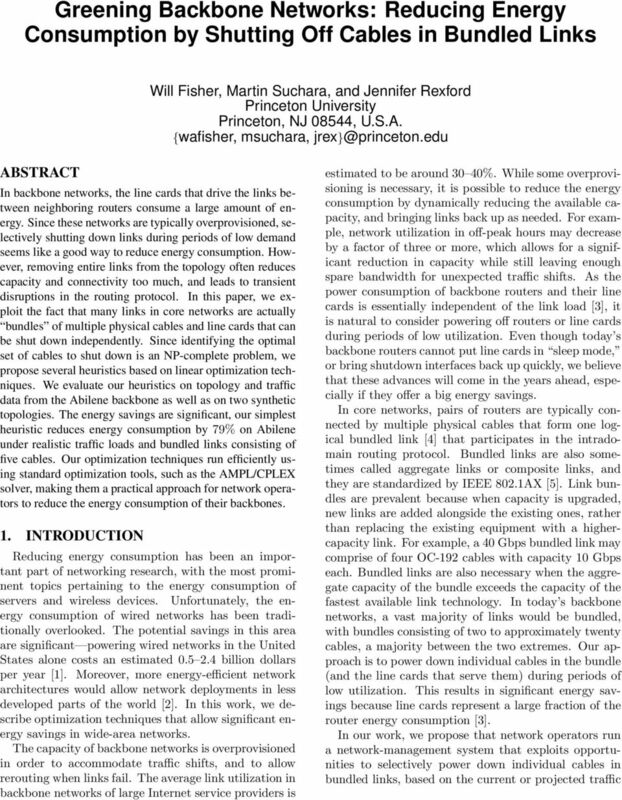 Download "Greening Backbone Networks: Reducing Energy Consumption by Shutting Off Cables in Bundled Links"
3 useful because it leads to a simple linear-programming solution that will be used for: (i) determining if a given network topology can satisfy all demands (important for determining whether any cables could be shut down), (ii) calculating the maximum amount of spare capacity (serving as an upper bound on the energy savings of any solution constrained by the bundle size), and (iii) providing an initial distribution of traffic that can serve as a starting point for heuristics that search for better solutions. The resulting linear-programming problem formulation is as follows: min (u,v) E f(u, v) s.t. D f d(u, v) c(u, v) (u, v) E, v V f d(u, v) = v V f d(v, u) d, u s d, t d, v V f d(s d, v) = v V f d(v, t d ) = h d d. (1) The objective function minimizes the total flow summed over all links. A capacity constraint ensures that no edge carries more traffic flow than its capacity. A flowconservation constraint ensures that no flow is lost or created except at the source and destination. 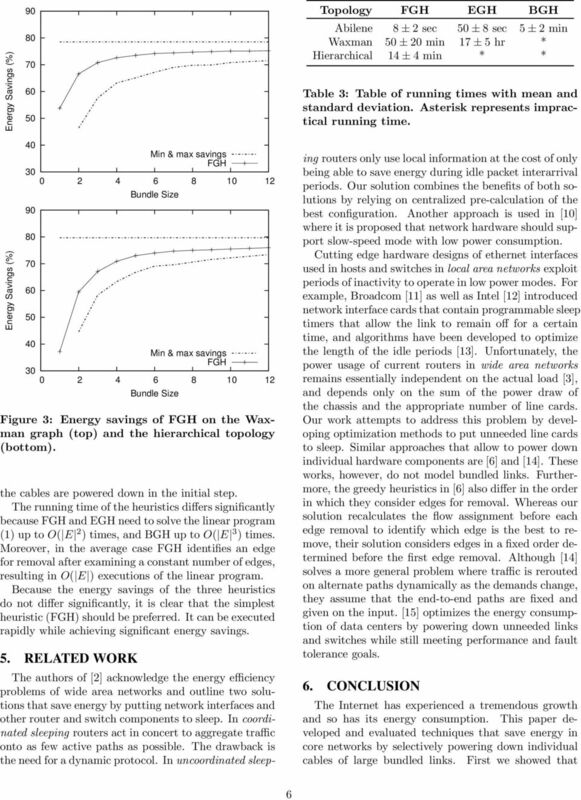 The final constraint ensures that the sum of the flows leaving the source, or entering the destination, of commodity d sums to h d. Obviously the optimization problem has a feasible solution exactly when the given network topology can satisfy all of the demands; therefore, we use this optimization in the next section as a building block to test feasibility after a cable is powered down. In addition, we can use the linear-programming solution to obtain an upper bound on the energy savings of any feasible solution as follows. For each edge (u, v) we simply round down by using one fewer cable in the bundle than is needed to carry the traffic f(u, v) obtained by the solution. For example, if a solution assigns 6.3 Gbps of traffic to an edge (u, v) whose capacity is 10 Gbps, and the edge consists of ten 1 Gbps cables, we remove four cables to have 6 Gbps of capacity. 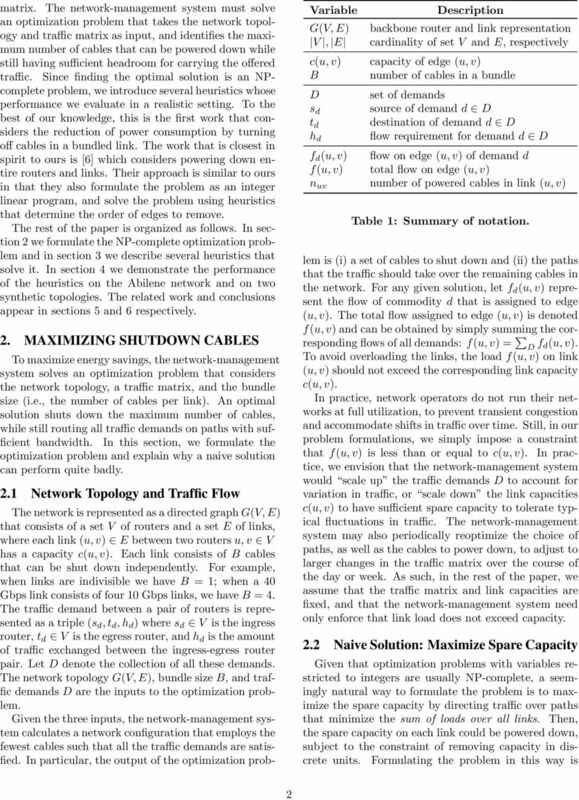 It is easy to verify that no flow assignment that satisfies all the demands can use fewer cables. A lower bound is obtained similarly. 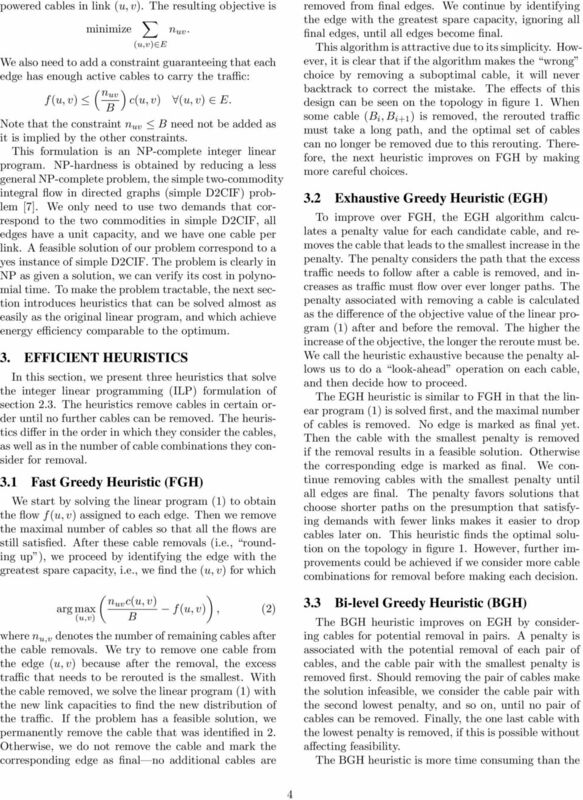 By rounding up to the next discrete number of cables (e.g., from 6.3 Gbps to 7 Gbps), we obtain an approximate solution that provably satisfies all the demands, serving as a strawman heuristic for identifying which cables to shut down. Unfortunately, the following subsection shows that this technique often results in extremely suboptimal solutions, leading us to formulate our problem as an integer optimization problem. 2.3 Integer Linear Program Formulation To see why the naive solution is suboptimal, consider the example in Figure 1. The network has k + 1 edges on the direct path from source S to each destination T i, and all edges have unit capacity. The source S has a small amount of traffic to send to each destination T i ; that is, demands (S, T i, ɛ) for i = 1, 2,..., n, where ɛ 1. Similarly, S sends a small amount of traffic to B 0 ; that is, a demand (S, B 0, ɛ). And, each node B i sends a small of traffic to its right neighbor; that is, demands (B i, B i+1, ɛ) for i = 0, 1,..., k 1 and (B k, T i, ɛ) for i = 1, 2,..., n. Let us also assume that B = 1. The optimal solution of the linear program (1) uses the shortest path for each demand to maximize the spare capacity. 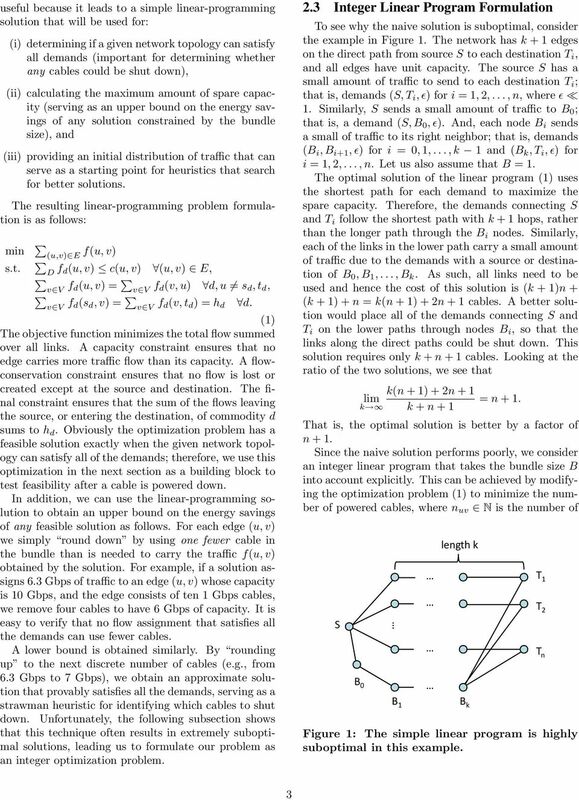 Therefore, the demands connecting S and T i follow the shortest path with k + 1 hops, rather than the longer path through the B i nodes. Similarly, each of the links in the lower path carry a small amount of traffic due to the demands with a source or destination of B 0, B 1,..., B k. As such, all links need to be used and hence the cost of this solution is (k + 1)n + (k + 1) + n = k(n + 1) + 2n + 1 cables. A better solution would place all of the demands connecting S and T i on the lower paths through nodes B i, so that the links along the direct paths could be shut down. This solution requires only k + n + 1 cables. Looking at the ratio of the two solutions, we see that k(n + 1) + 2n + 1 lim = n + 1. k k + n + 1 That is, the optimal solution is better by a factor of n + 1. 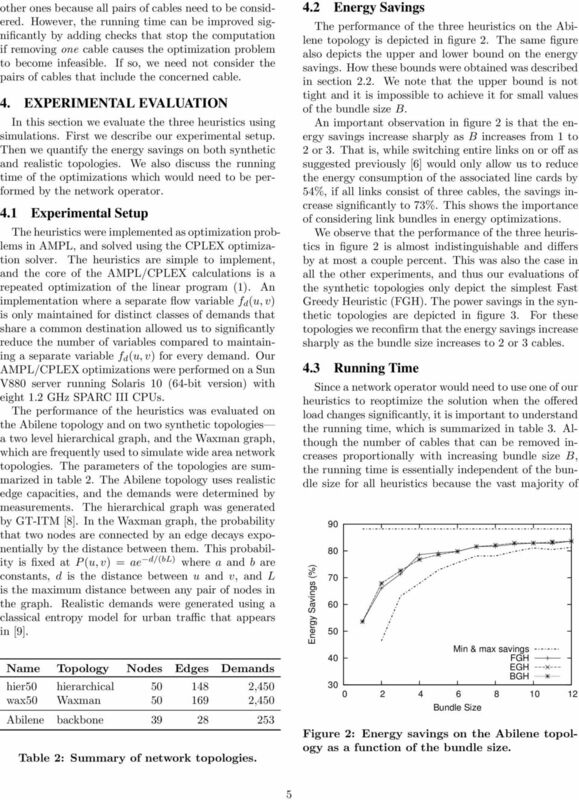 Since the naive solution performs poorly, we consider an integer linear program that takes the bundle size B into account explicitly. This can be achieved by modifying the optimization problem (1) to minimize the number of powered cables, where n uv N is the number of S B 0 B 1 length k B k T 1 T 2 Figure Number 1: The of links simple needed: linear program is highly suboptimal a) Shortest in path: this example. kn + k + n = k(1+n) + n b) Optimal: k + n T n Demands (S,T i ): ε (S,B 1 ): ε (B i,b i+1 ): ε (B k,t i ): ε 3 Let n be an arbitrary constant. 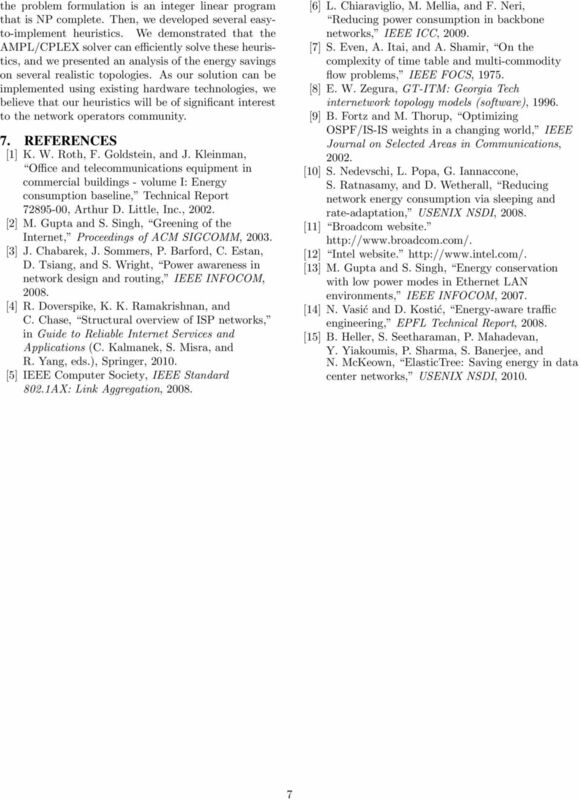 Because lim (k > inf) (k(1+n) (( + n) / (k + n) = 1 + n the optimal number of links needed is ~n times lower.
! Solve problem to optimality. ! Solve problem in poly-time. ! Solve arbitrary instances of the problem. !-approximation algorithm.
! Solve problem to optimality. ! Solve problem in poly-time. ! Solve arbitrary instances of the problem. #-approximation algorithm. R2. The word protocol is often used to describe diplomatic relations. How does Wikipedia describe diplomatic protocol?